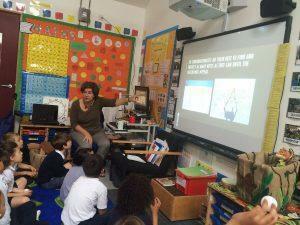 The educational outreach work MEDASSET does usually happens in Greece. So when the office in Athens got a call from a primary school in the UK, asking if someone could come and talk to their class of 6-year-olds about our work, we thought we would have to decline. But Sophie Petrou, a class teacher from Kentish Town C of E Primary School in London, explained that, using a democratic process, her class had chosen sea turtles to be the beneficiaries of its charity fund-raising effort this year. So, feeling obligated on account of the children’s interest and generosity, we realised we should make a special effort to respond. Although I’m not a trained educator, as one of MEDASSET’s very few resident Londoners I was press-ganged to visit the school and talk to the children. I felt just turning up and showing a video might be a little underwhelming in the age of internet whizz-bangs so I thought hard about how I might present our material. After all, there’s nothing more scary than a sea of expectant young faces and I didn’t want to be a disappointment. So I invented a game. It involved two soft toy animals – a fox and a turtle – two hessian-covered baskets (a nest and a den), and over 60 ping-pong balls as stand-ins for turtles’ eggs. The aim was to ‘rescue’ the eggs from the hungry fox who had dug them up and taken them to his den. ‘Rescued’ eggs could be put back in the turtle’s nest. The children could gain the right to do this by asking a good question or correctly answering one of mine. Each child was given an egg to start with and off we went! It could have been chaos but somehow, miraculously, it worked. It was a challenge to try and select a different face each time from among the group… so many of them were keen to get in on the act and ‘save’ their eggs. I thought one or two might actually burst, such was the enthusiasm. After a break for running about in the garden, the boys and girls rushed back into the classroom for more. Next, Sophie wanted an activity for them, so I suggested they might like to design their own signs that could be attached to the type of protective nest-cage that conservationists place on turtle nesting beaches. Coloured pens and crayons appeared, 30 heads bent over tables and the room went quiet with concentration. The range of ideas and slogans the children came up with was just amazing. And they were all unbelievably well behaved the whole time. I will try to keep my promise to them to get their signs attached to real cages on a real nesting beach. They deserve it. Just before “going home time” there was a final session of quick-fire questions about what sea turtles eat, in a desperate race to try and ‘save’ every last egg from the fox and give it back to the mother turtle. We just about made it in time. The Willows managed to raise £100 for MEDASSET at their class tea and raffle. We are immensely grateful.